The Flag of Scotland (Scottish Gaelic: Bratach na h-Alba; Scots: Banner o Scotland), also known as St Andrew's Cross or the Saltire, is the national flag of Scotland. As the national flag, the Saltire, rather than the Royal Standard of Scotland, is the correct flag for all individuals and corporate bodies to fly. 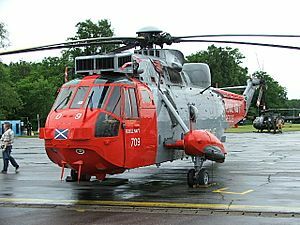 It is also, where possible, flown from Scottish Government buildings every day from 8am until sunset, with certain exceptions. 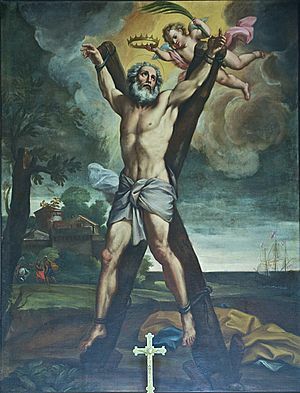 According to legend, the Christian apostle and martyr Saint Andrew, the patron saint of Scotland, was crucified on an X-shaped cross at Patras, (Patrae), in Achaea. Use of the familiar iconography of his martyrdom, showing the apostle bound to an X-shaped cross, first appears in the Kingdom of Scotland in 1180 during the reign of William I. It was again depicted on seals used during the late 13th century, including on one used by the Guardians of Scotland, dated 1286. Using a simplified symbol which does not depict St. Andrew's image, the saltire or crux decussata, (from the Latin crux, 'cross', and decussis, 'having the shape of the Roman numeral X'), began in the late 14th century. In June 1385, the Parliament of Scotland decreed that Scottish soldiers serving in France would wear a white Saint Andrew's Cross, both in front and behind, for identification. The earliest reference to the Saint Andrew's Cross as a flag is found in the Vienna Book of Hours, circa 1503, in which a white saltire is depicted with a red background. In the case of Scotland, use of a blue background for the Saint Andrew's Cross is said to date from at least the 15th century, with the first certain illustration of a flag depicting such appearing in Sir David Lyndsay of the Mount's Register of Scottish Arms, circa 1542. The legend surrounding Scotland's association with the Saint Andrew's Cross was related by Walter Bower and George Buchanan, who claimed that the flag originated in a 9th-century battle, where Óengus II led a combined force of Picts and Scots to victory over the Angles, led by Æthelstan. Supposedly, a miraculous white saltire appeared in the blue sky and Óengus' troops were roused to victory by the omen. Consisting of a blue background over which is placed a white representation of an X-shaped cross, the Saltire is one of Scotland's most recognisable symbols. 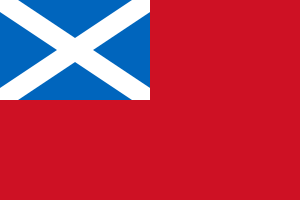 The flag proportions are not fixed, however the Lord Lyon King of Arms states that 5:4 is suitable. (Flag manufacturers themselves may adopt alternative ratios, including 1:2 or 2:3). The ratio of the width of the bars of the saltire in relation to the width of the field is specified in heraldry in relation to shield width rather than flag width. However, this ratio, though not rigid, is specified as one-third to one-fifth of the width of the field. 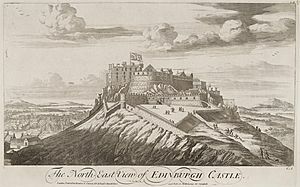 According to legend, in 832 A.D. Óengus II led an army of Picts and Scots into battle against the Angles, led by Æthelstan, near modern-day Athelstaneford, East Lothian. The legend states that whilst engaged in prayer on the eve of battle, Óengus vowed that if granted victory he would appoint Saint Andrew as the Patron Saint of Scotland; Andrew then appeared to Óengus that night in a dream and assured him of victory. 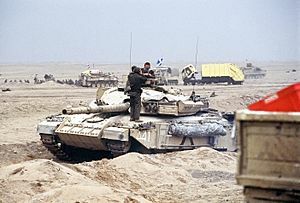 On the morning of battle white clouds forming the shape of an X were said to have appeared in the sky. Óengus and his combined force, emboldened by this apparent divine intervention, took to the field and despite being inferior in terms of numbers were victorious. Having interpreted the cloud phenomenon as representing the crux decussata upon which Saint Andrew was crucified, Óengus honoured his pre-battle pledge and duly appointed Saint Andrew as the Patron Saint of Scotland. The white saltire set against a celestial blue background is said to have been adopted as the design of the flag of Scotland on the basis of this legend. Although the earliest use as a national symbol can be traced to the seal of the Guardians of Scotland in 1286, material evidence for the Saltire being used as a flag, as opposed to appearing on another object such as a seal, brooch or surcoat, dates from somewhat later. The huge heraldic standard of the Great Michael had the "Sanct Androis cors" on a blue background in the Hoist and by 1542 a white saltire set against a blue background was depicted as being the flag of Scotland. An even earlier example known as the "Blue Blanket of the Trades of Edinburgh", reputedly made by Queen Margaret, wife of James III (1451–1488), also shows a white saltire on a blue field. However, in this case the saltire is not the only emblem to be portrayed. A further Scottish distinction from the UK flag days is that on Saint Andrew's Day, (30 November), the Union Flag will only be flown where a building has more than one flagpole; the Saltire will not be lowered to make way for the Union Flag where a single flagpole is present. If there are two or more flagpoles present, the Saltire may be flown in addition to the Union Flag but not in a superior position. This distinction arose after Members of the Scottish Parliament complained that Scotland was the only country in the world where the potential existed for the citizens of a country to be unable to fly their national flag on their country's national day. (In recent years, embassies of the United Kingdom have also flown the Saltire to mark St Andrew's Day). Many bodies of the Scottish Government use the flag as a design basis for their logo; for example, Safer Scotland's emblem depicts a lighthouse shining beams in a saltire shape onto a blue sky. 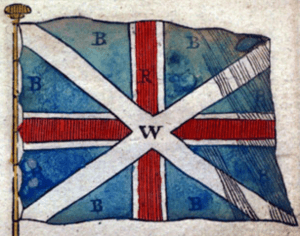 Other Scottish bodies, both private and public, have also used the saltire in similar ways. Use of the Saltire at sea as a Jack or courtesy flag has been observed, including as a Jack on the Scottish Government's Marine Partrol Vessel (MPV) Jura. The ferry operator Caledonian MacBrayne routinely flies the Saltire as a Jack on vessels which have a bow staff, including when such vessels are underway. This practice has also been observed on the Paddle Steamer Waverley when operating in and around the Firth of Clyde. The practice of maritime vessels adopting the Saltire, for use as a jack or courtesy flag, may lead to possible confusion in that the Saltire closely resembles the maritime signal flag M, "MIKE", which is used to indicate "My vessel is stopped; making no way." Obviously mariners who understand this signal code also understand that the saltire is displayed on the jackstaff and not as a signal. For the benefit of Scottish seafarers wishing to display a Scottish flag other than the Saltire, thereby avoiding confusion and a possible fine, a campaign was launched in November 2007 seeking official recognition for the historic Scottish Red Ensign. Despite having last been used officially by the pre-Union Royal Scots Navy and merchant marine fleets in the 18th century, the flag continues to be produced by flag manufacturers and its unofficial use by private citizens on water has been observed. In May 2016, the Saltire was flown from horseback during The Queen's 90th birthday celebration at Windsor, alongside the flags of England, Northern Ireland and Wales. —Proclamation of James VI, King of Scots: Orders in Council – 12 April 1606. —Letter from the Privy Council of Scotland to James VI, King of Scots – 7 August 1606. 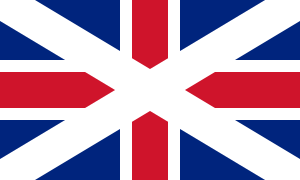 "Scots union flagg as said to be used by the Scots.". 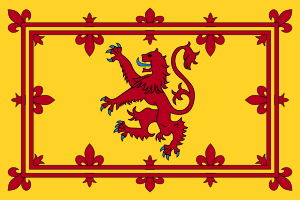 Flag of Scotland Facts for Kids. Kiddle Encyclopedia.